Jews around the world are highly concerned about the direction of the city – and 71 percent of them argue that it is moving in the wrong direction. Jews in Israel also have a relatively dim view of the city’s trajectory. Fifty-seven percent of them argue that it is moving in the wrong direction (it is 59 percent among Israeli Jews who do not live in Jerusalem). However – and this is surely significant – the Jewish residents of Jerusalem have a much more positive assessment of the city’s direction. A majority (55 percent) of them believe the city is actually moving in the right direction. That is to say: the people who are most familiar with the city, also have a more positive view of its direction it is taking (again, it is important to distinguish between the Dialogue survey, which all participants completed, and JPPI’s survey of Israelis, which is a scientific poll with a sample that represents the views of Israeli Jews). 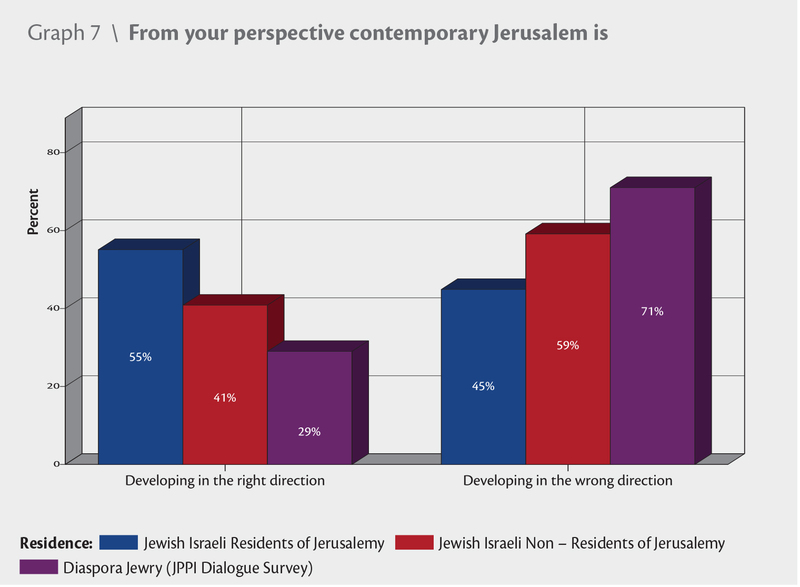 The fact that a majority of Jews assert that the city is moving in the wrong direction (we can quite safely assume that Jews who were not represented in the Dialogue process may have an even dimmer view of the city’s direction) is significant. If Jerusalem “should be the central address of the Jewish people,” as a Palm Beach participant argued, then having this address moving in the wrong direction is not a positive development. If Jerusalem is “the spiritual, religious, and national center” of the Jewish people, as Sheffer and Tzur argue, then having this center moving in the wrong direction is not a positive development. But Jerusalem – a city much bigger than the sum of its residents – is still also a city of many hundreds of thousands residents. The fact that a (slim) majority of Jewish Jerusalemites believe the city is moving in the right direction is also significant. These different, conflicting assessments could trigger a debate among Jews around two important questions: 1) Who knows Jerusalem better? and 2) Who owns Jerusalem? In other words, there are two main ways to understand the differences of opinion concerning the city’s trajectory between Jews who live in Jerusalem and those who do not. One way is to assume that different outlooks result in different assessments of the situation. Namely, Jews in Jerusalem have a more intimate familiarity with their city and, therefore, see positive trends that other Jews cannot see (or cannot yet see). Of course, it is also possible to argue that the intimate familiarity of Jerusalemites with their city makes it difficult for them to look at it with objective eyes – as other Jews can do from afar. Another way is to assume that a different expectation results in a different assessment of the situation. Namely, that what the Jewish people expect from Jerusalem is different from what the majority of Jews in Jerusalem expect their city to be. Of course, all Jews, both in and outside of Jerusalem, acknowledge the centrality of the city to Jewish life and culture. Nevertheless, for ideological or practical reasons they differ in the way they would like this centrality to manifest itself. For lack of sufficient data, it would be impossible for JPPI to conclude with certainty which of the two hypotheses (different outlook vs. different expectations) accurately captures the reason Jerusalemite Jews are more satisfied with the city’s direction than other Jews. But there are signs that we can still use to better understand this phenomenon. The simplest of which is to look at the composition of Jerusalem’s population and compare it to the composition of Jews who voice satisfaction or dissatisfaction with the city’s direction. Last year, JPPI submitted a report to the Israeli government dealing with demographic trends in Jerusalem, prepared by JPPI Senior Fellow, Prof. Uzi Rebhun. This document reported that on the eve of the state’s founding, in 1946, Jerusalem was home to 164,000 residents. Following the 1967 reunification of Jerusalem, the number of citizens stood at slightly more than a quarter million. Jerusalem’s population today is 850,000, Israel’s largest city. With the reunification of the city (and partially because of the still-controversial decision to include many predominantly Arab areas within its municipal borders), a large number of non-Jewish residents was added to Jerusalem. The proportion of Jews was reduced to three-quarters, and this has continued to decline over time and currently stands at 62.8 percent of the city’s population. Almost all residents in the western part of the city are Jewish, whereas in the eastern part Jews make up 40 percent of the population. In absolute terms, 200,000 Jews reside in the Jewish neighborhoods of the eastern section and the old city. Jerusalem’s Jewish population is also undergoing demographic changes, the most significant of which is the rapid growth of the ultra-Orthodox (Haredi) sector. Although the internal balance of migration for all Jews in Jerusalem is negative, high rates of natural growth in the Haredi sector balance out migration and the Haredi sector’s share of the overall Jewish population is gradually increasing. Over the course of about five years, from 2008 to 2013, the Haredi proportion of Jerusalem’s total Jewish population increased from 29 to 34 percent (graph 8). Notably, Haredim constitute 10 percent of the total Jewish Israeli population. As the Haredi share of Jerusalem’s Jewish population has grown, that of traditional Jews in the city declined (from 33 to 27 percent). The proportion of secular Jews has remained stable. All in all, Jewish Jerusalem today is a city with a majority of practicing Orthodox Jews (53 percent) along with a large segment of traditional Jews (27 percent). This composition of Jews could provide us with one key to understanding why Jews in Jerusalem are more satisfied than other Jews with the city’s current trajectory. 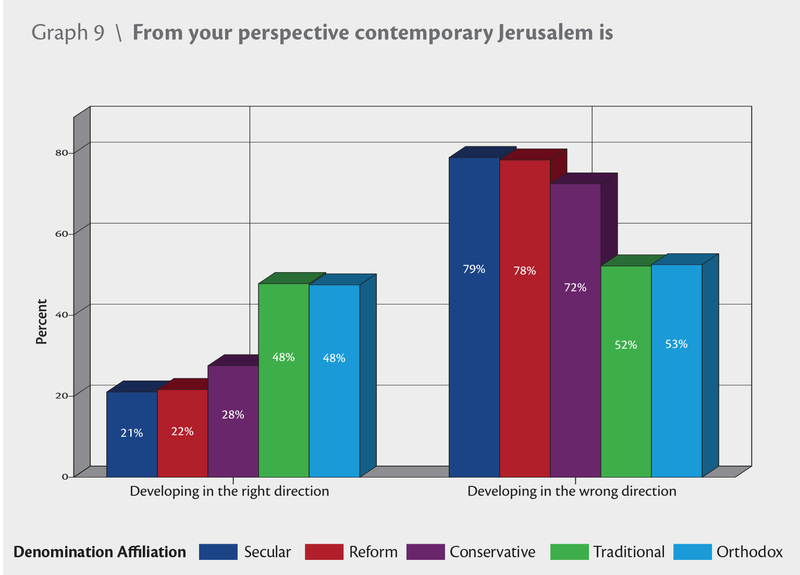 Jerusalem is relatively conservative, religiously and politically, (in 2015, 79 percent of the city’s eligible voters supported the current right-wing-religious coalition), and so are the groups that seem more satisfied with Jerusalem’s trajectory. 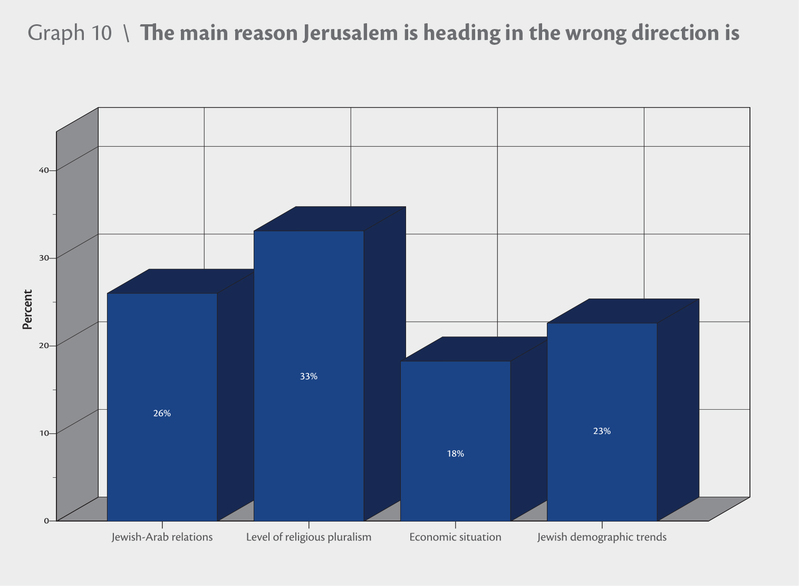 Even among Jews who live outside of Israel, the Orthodox and traditional groups tend to be more optimistic about the city’s future – they are close to evenly split between “right direction” and “wrong direction” (graph 9). 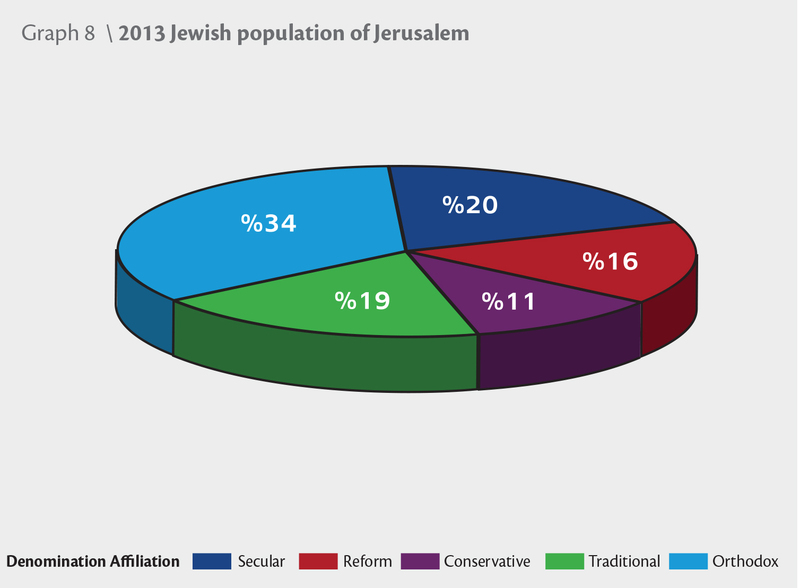 The groups that take a harsher view of Jerusalem’s future are the groups less represented among Jerusalemite Jews. Close to 80 percent of secular and Reform Jews argue that Jerusalem in developing in the wrong direction – perhaps because of the visible decline of non-Orthodox groups in Jerusalem. A 53 percent majority of Orthodox Jews believe that the city is developing in “the right direction” – possibly because they feel more comfortable in a city whose cultural atmosphere is compatible with their own ideology and culture. The specific concerns Dialogue participants outlined as they were asked to explain their negative assessment of the city’s direction give even more credence to the theory that the Jews of Jerusalem are satisfied with the city exactly for the same reasons that worry their fellow Jews in other countries. The survey provided participants who thought Jerusalem is developing in the wrong direction with seven options (plus the option to write in something else) to explain their misgivings. The options were: Jewish-Arab relations; level of religious pluralism; the economic situation; Jewish demographic trends; the material state of the city; cultural vibrancy (Insufficient); religious vibrancy (Insufficient). 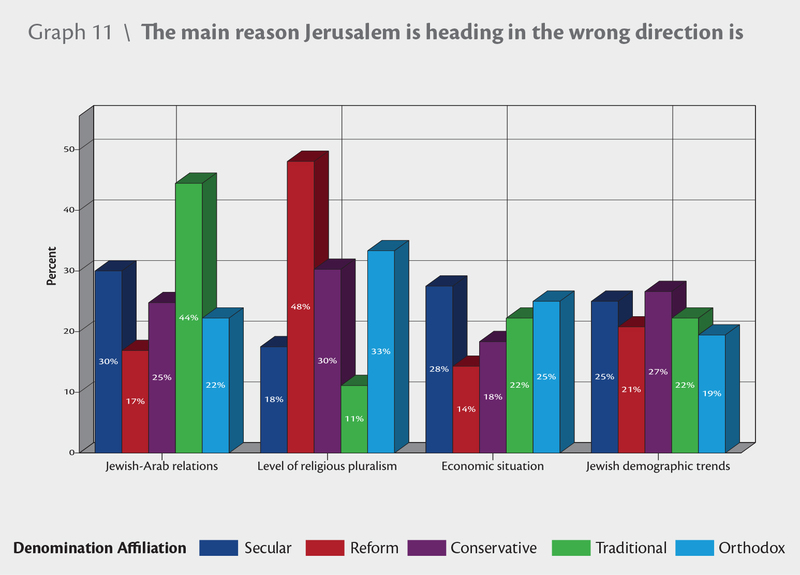 Participant assessments show (graph 10) that intra-Jewish concerns top the list of factors that make Jews worldwide uneasy about Jerusalem’s direction; Jewish-Arab issues ranked second. Thirty-one percent cited “Level of Jewish pluralism” as a main concern and 21 percent cited “Jewish demographic trends” as such. Together they can be decoded as expressions of discomfort with the dominance of Orthodoxy in Jerusalem. This shows that the majority of dissatisfied participants had the intra-Jewish religious composition of the city in mind when they identified movement in the “wrong direction.” Jewish-Arab relations in the city was emphasized less, but was still a concern of many participants. It should come as no surprise that Dialogue participants with a politically liberal and religiously progressive bent differed from those Jerusalem residents whose bent is both politically and religiously conservative in their assessment of Jerusalem’s direction. As one might expect, concerns differ according to several variables; religious affiliation is an important one (graph 11). For example, secular participants were notably more concerned with “secular” issues – Jewish-Arab relations, the economic situation – and less so with the level of religious pluralism. On the other hand, Reform participants were mostly troubled by the level of religious pluralism in Jerusalem, and paid relatively little attention to its economic situation. All in all, the significance of religious pluralism is highlighted by participants affiliated with religious traditions (Reform, Conservative, Orthodox). Note that a small percentage of participants also had “other” concerns. These included the “material state of the city,” “cultural vibrancy,” “religious vibrancy,” and a few others. Internal surveys by Israeli institutions show even greater satisfaction of Jerusalemites with the city’s direction. Based on analysis by Prof. Rebhun for the five-year period 2009-2013. This number refers to “traditional, not religious” Jews and to “traditional-religious” Jews. The numbers of “secular” and “religious” Jews in Jerusalem remained about the same according to Rebhun’s assessment. In Jerusalem, Likud won 24.23% of the vote, while 21.11% of the capital’s voting residents cast their ballots for United Torah Judaism, 11.96% for Shas, 9.68% for the Zionist Union, 8.32% for Habayit Hayehudi, 7.19% for Yahad, 4.68% for Kulanu, 4.21% for Yesh Atid, 3.98% for Meretz, 2.37% for Yisrael Beiteinu, and 1.24% for the Joint List. See: Election Results by City: Likud Won in Eight Out of the 10 Largest Cities, Haaretz, March 18, 2015.